This bright cover with it’s beautiful river dragon probably looks familiar to anyone with a young daughter as Creative Girls Club sent out mailings all over the United States with this book included as a surprise gift. WELLSPRING OF MAGIC is about a group of young friends who discover a way to enter a magical world – a world where they have unexpected magical abilities. Those abilities are put to the test in this book as the girls discover they are princesses in this realm, and everyone is counting on them to save the world! Good news: the second book in the Wellspring series, THE EMERALD DRAGON, is available in paperback on May 1, 2015. Sales will determine if the third book, THE HAUNTED LIBRARY, is eventually available. So what have girls thought about these books? * We started reading the book last night and Eleanor didn't want me to stop. The characters are wonderful!!! 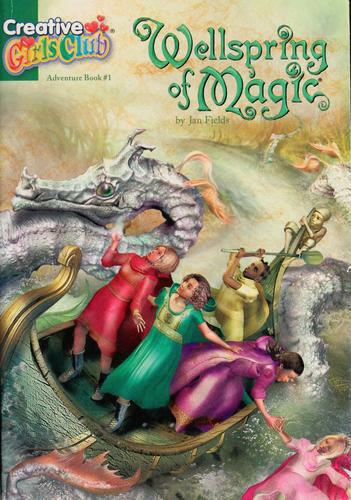 * My 8-year-old daughter, Emily, LOVES your Wellspring of Magic Book 1. She has not put it down all week and has read it 5 times in a row!! I just wanted to say "thank you" for writing a fun, creative book that really motivates our kids to enjoy reading! * I am eight years old. I really loved the Wellspring of Magic. I loved it so much it has become my first favorite book and I have read a lot of books. I have read it at least 20 times. I’m really lucky to have heard from so many parents and children about this little book. Thank you for your emails and letters.